EXECUTIVE SUMMARY: For anyone curious to see just how ugly ultraliberalism can get, Sweden is the ideal case study. The deep presence of anti-Semitism in Sweden reveals that the country’s image as a near perfect liberal democracy is false. So serious is the problem that the country is in dire need of a national anti-Semitism commissioner who can point out the threats coming from neo-Nazis and Muslims, the flaws of the police and the justice system, and other failures of the authorities to deal with anti-Semitism. But Sweden’s purported love of free speech is unlikely to extend so far as to give a mouthpiece to such a person. In this century, only one Jewish community in all of western Europe has decided to dissolve itself because of nonstop threats from neo-Nazis: the community in the town of Umea, in northeastern Sweden. Jews in Sweden account for less than 0.2% of the population, but they are the targets of profound hatred. This does not comport very well with Sweden’s image as a near-perfect liberal democracy. Major anti-Semitic threats to Swedish Jews have come out of parts of the Muslim community. In 2017, a movie was shown on Bavarian television about the visit to Malmö, Sweden’s third-largest city, by the German Jewish author Henryk Broder and the Egyptian writer Hamad Abdel Samad. They met several local Jews, including the town’s American rabbi. He told them the shrinking community had installed bullet-proof windows at the synagogue, but even that precaution didn’t keep them safe. A bomb went off in front of the synagogue and another was thrown into the chapel of the Jewish cemetery, which was totally destroyed. The rabbi himself is regularly harassed when walking on the street. Objects thrown at him have included an apple, a lighter, a glass, and a bottle. In an indication of the lack of police control, when Broder and Samad came to Malmö, they were told by police not to open the windows of their car when they were driving through a Muslim neighborhood. The number of complaints about hate crimes in Malmö reached a record in 2010 and 2011. It did not lead to any convictions. 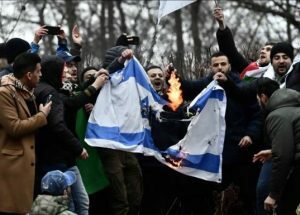 In December 2017, two Palestinians and a Syrian threw Molotov cocktails at a synagogue in Sweden’s second-largest city, Gothenburg. Some 20 youngsters who were meeting in the building took shelter in its cellar during the attack. A Swedish appeals court overturned a criminal tribunal ruling that had decided that one of the perpetrators, a Gaza-born Palestinian, would be deported at the end of his two-year prison term. The court said he should not be deported because the anti-Semitic nature of the attack could put him in danger from Israel. The court thus preferred the imagined interests of the perpetrator over the actual interests of his victims. The judges were apparently unconcerned that if he stayed in Sweden he might commit more crimes. In recent years, Sweden has taken in the highest number of migrants in western Europe as a percentage of population. Most immigrants come from Muslim countries where societies are permeated by extreme anti-Semitic prejudices. The authorities there promote Jew-hatred as national policy. Sweden can thus be characterized as a major importer of anti-Semites out of humanitarian motives. But anti-Semitism in Sweden is not limited to Muslims and neo-Nazis. A recent scandal concerns the highly reputable hospital of Karolinska University, near Stockholm. This institution annually awards the Nobel Prize in medicine. The Simon Wiesenthal Center (SWC) wrote a complaint to the hospital’s dean when it became known that open anti-Semitism among the hospital’s senior physicians had been ignored by management for almost a year. There were also anti-Semitic comments posted on Facebook. Two Jewish employees had already quit over this issue. Management finally acted only after Sweden’s largest paper, Aftonbladet, reported on the hatemongering. Thereafter one of the physicians in question left. There are many problems in Sweden that the government doesn’t want to confront. Before the Swedish parliamentary elections, then Norwegian Immigration Minister Sylvi Listhaug traveled to Stockholm and visited the extremely violent Rinkeby suburb. She made a point of noting that there are more than 60 no-go zones in Sweden. The Swedish migration minister responded to this observation by canceling her meeting with Listhaug. The problems with immigrants have given rise to the growth of a right-wing populist party, the Sweden Democrats. In the September 2017 elections they got 17% of the vote, an unprecedented level of support. This party promotes the prohibition of nonmedical circumcision. While this measure is aimed primarily against Muslims, who vastly outnumber Jews, it is serving to introduce a new anti-Semitic element into Sweden. Sweden has also long led western Europe in anti-Israelism. The country’s best known postwar PM, the Social Democrat Olof Palme, was one of the very few leaders of a democratic country to openly compare Israel’s acts to those of the Nazis. The current Swedish Foreign Minister, Margot Wallström, also a Social Democrat, has asked for an investigation into the killing of terrorists by Israel. She hasn’t made any such request from other democratic countries where terrorists have been killed after attacks. By singling Israel out in this way, Wallström committed an anti-Semitic act according to the International Holocaust Remembrance Alliance definition. The above is but a small selection of events to illustrate the falseness of Sweden’s image as a near-perfect liberal democracy. For anyone curious to see just how ugly ultraliberalism can get, Sweden is the ideal case study. Freedom House, according to its website, is an “independent watchdog organization dedicated to the expansion of freedom and democracy around the world.” Sweden is one of the few countries to which it has granted the maximum possible number of points for freedom, one hundred. Freedom House bases its judgments on issues like political rights, civil liberties, pluralism, the functioning of government, supposed freedom of the media, and so on. The few cases mentioned above indicate not only that Freedom House’s ranking system is flawed, but that absolute freedom is far from desirable. All in all, the attitude towards Jews and their experience in a country may be a better indicator of that country’s democratic reality than a Freedom House ranking. This is certainly true concerning Sweden. Sweden urgently needs to appoint a national Anti-Semitism Commissioner. Such a person might point out the anti-Semitic threats coming regularly from neo-Nazis and Muslims, the flaws of the police and justice system, and other failures of the authorities to deal with anti-Semitism. But Stockholm is highly unlikely to appoint such a person. Though it purports to be a model democracy that believes in free speech, Sweden would not welcome the revelations that would result.